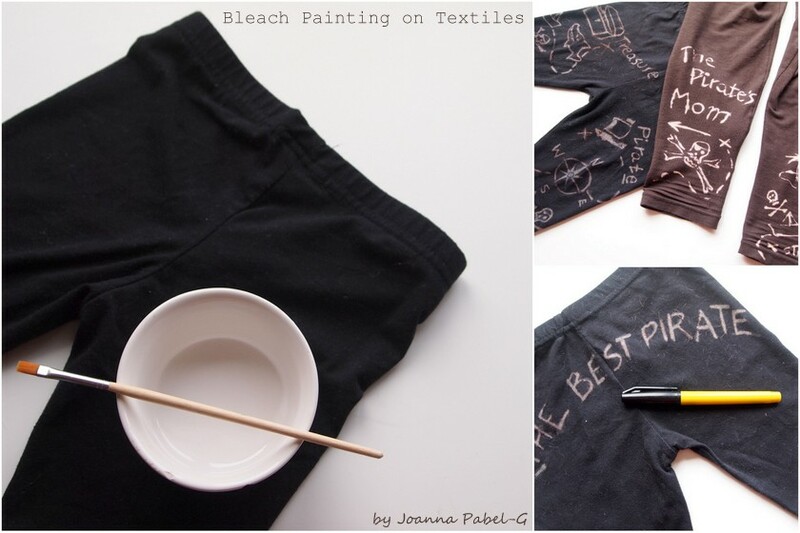 Be Creative Mummy / UK lifestyle Blog / Crafts: Bleach Painting on Textiles. Bleach painting is easy way to play with old clothes and you'll love the results! I chose to create a pirate theme. I hope you enjoy my take on painting with bleach! There are so many options for bleach painting. I think it ended up looking pretty :-). I love this!!!! what a great idea. Thanks for joining our Show Off Your Blog Party. I'm one of the co-host. This is great! What a fun way to create things and so very easy too! Thank you for sharing this @ The Show Off Blog Party! Thanks so much for sharing this on Tutorial Thursdays Linky Party- I can't wait to see what you will be sharing this week. This is such a neat idea, I will have to try this!! thanks Camille. You should try it. it's fun.